Fresno, Calif. (AP) – Identical twins have given birth about two hours apart from each other. The Fresno Bee reports that BaoKou Yang went into labor first on Sunday, November 4. Shortly after, her sister BaoNhia Yang told her she was experiencing pain and “might be in labor with you.” BaoKou gave birth at 6:59 p.m. Sunday. Her sister then delivered at 8:48 p.m. Both gave birth to daughters who almost were the same weight. The identical twins are from a family of 14 children and say they were inseparable growing up in Fresno. The sisters had bet on who would give first but say they never thought it would be so close, since their due dates were two days apart. They say they’re excited that their babies will share a birthday just like them. Kentwood, Mich. (AP) – Twin sisters who represented different parties when they ran for seats on the same western Michigan county board will not be working side-by-side. Monica Sparks, a Democrat, and her Republican sister, Jessica Ann Tyson, each won their party’s nomination for the Kent County Board of Commissioners in August during the Michigan primary election. They ran in different Grand Rapids-area districts for the seats. Unofficial results show Sparks was the top vote-getter Tuesday for her seat, while Tyson finished second in her district. That means Sparks will serve on the board while her sister won’t. Sparks has said she decided to run for office when her sister declared her candidacy. They’ve said they were adopted into a family that taught them to pay attention to government and public affairs. Davie, Fla. (AP) – Florida authorities have caught a huge lizard that has terrified residents of a suburban Miami neighborhood for months. 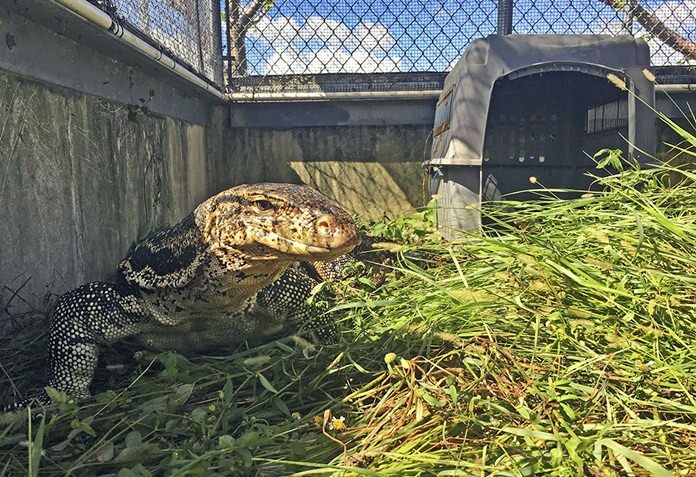 The Florida Fish and Wildlife Conservation Commission said Thursday the Asian water monitor lizard measures more than 8 feet (2.5 meters) long. The lizard is an escaped pet. It was first reported loose in August in a Davie neighborhood. Residents said it lurked in their backyards and scratched at their patio doors. Wildlife officers and Davie police officers caught it Tuesday after getting a tip from a resident who said the lizard frequently appeared on his property around midday. A wildlife commission statement says the lizard will be returned to its owner, who received a criminal citation for its escape. Owners must have cages to keep these lizards as pets. It’s illegal to release nonnative species in Florida. Berlin (AP) – The portable toilets kept on disappearing – and now a German company knows why. Two men in Germany have been convicted of stealing more than 100 portable toilets. The dpa news agency reported that Duesseldorf district court delivered its verdict Tuesday, giving a 40-year-old man a 10-month suspended sentence and a 28-year-old ex-colleague six months. Both men worked for a waste disposal company from whose premises the toilets – worth nearly 70,000 euros ($79,700) in all – gradually disappeared, a loss that was only discovered a few months later. The men admitted having sold the toilets to a company in the Netherlands via a go-between. Only three of the missing toilets have resurfaced. The defendants lost their jobs.